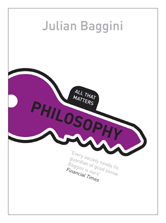 In Philosophy: All That Matters, bestselling philosopher Julian Baggini shows how abstract ideas feed into the most important existential questions of all. From ethics and metaphysics, to the philosophy of science and religion, Baggini explains what makes us different to other species, why philosophy lies at the heart of that difference, and why that matters. 7 Who and what are we?